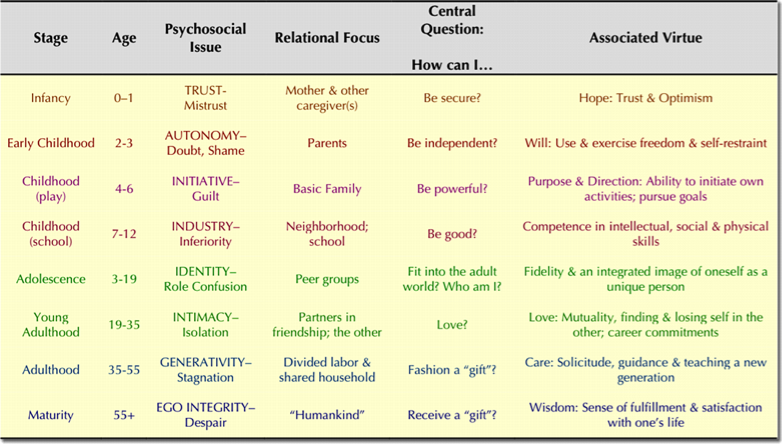 Toward Healthier Children – Erik Erikson’s Stages of Psycho-Social Development | Mark Rickerby's blog AND (insert trumpets here) God's Sitcom – Messin' with Mark! 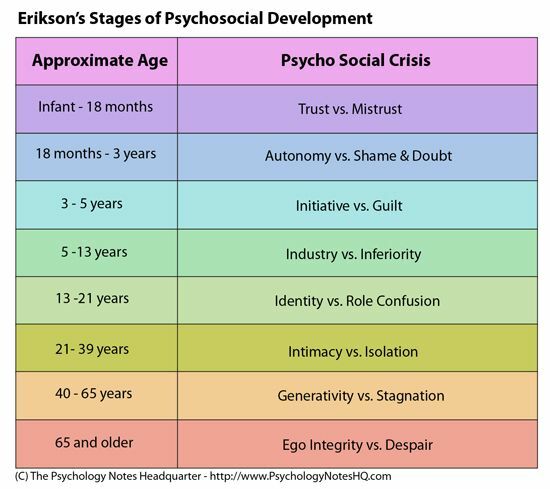 Erik Erikson was a psychologist who profoundly influenced my thinking since I first heard of his “stages of psycho-social development” in college. Because of this, most of us intuitively know what these stages are. After all, we lived them, or some of them. The sad part is, kids who don’t successfully navigate the early stages have a progressively harder time meeting the subsequent ones successfully. I know I did. This is why it’s important to go back and repair any damage. i.e., “do the work.” Even just identifying where we stumbled is useful. We can’t relive those days, of course, but we can have compassion for our former selves, understand why we felt the way we did, maybe even give ourselves what was denied us then, and in so doing, finally move on. Having a charted course also helps us help our children navigate these stages. This philosophy has been put many ways by many people. For most of us, falls are inevitable. No parent is perfect, and even if they were, there are 101 influences out in the world, not to mention random chaos (usually in the form of physical or psychological bullies) that also shape who we are. The crapshoot of getting good teachers or bad also molds children. 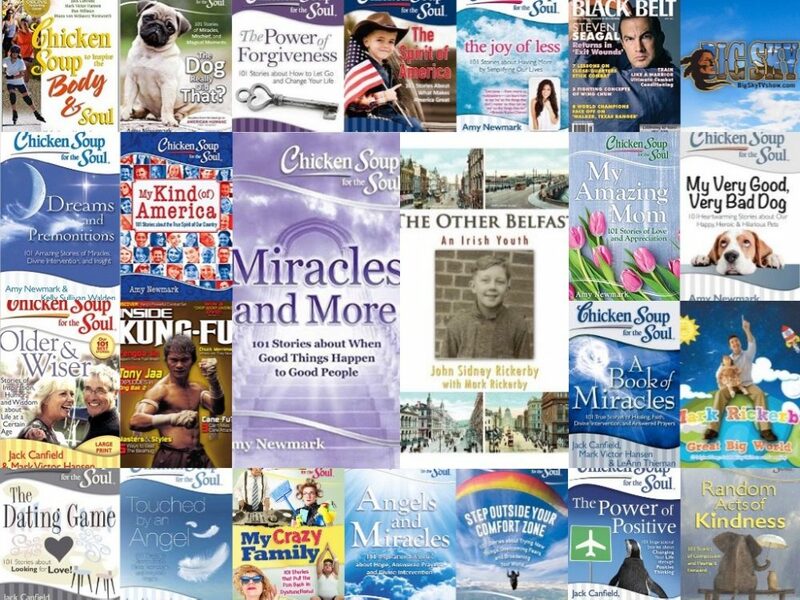 If you’re over forty and your parents were members of the “greatest generation” who lived through World War II, they probably never read a book on parenting or child psychology in their lives and you were under-analyzed as a result, often when a bit of scrutiny might have been helpful. As a child, I once incubated a fertilized hen’s egg. It was a lot more work than I thought it would be. I thought all I would have to do was put the egg in the homemade incubator and then wait for it to hatch. But I had to come home from school every day for 23 days (the gestation period of a chicken) and flip the egg over, then again at midnight, to keep the bird embryo from adhering to the bottom side of the egg. The mother hen does this instinctively. Then I was awoken one night by a high-pitched chirp. I jumped up excitedly and turned on the light to see a tiny, yellow beak breaking through the shell. I was so excited. Again, I underestimated the length of time it would take for the baby chick to come out. I had only seen it happen in movies, and of course, they can’t show a two hour process in a movie that’s only two hours long, so movie chicks just pop right out. Not so in real life. It was a marathon. I wanted to crack the shell open and help the bird but I had read somewhere that if I did, the chicken would probably not survive. Not just be weak, mind you – it would not survive. That first challenge actually determines its ability to survive, it’s strength and courage, for the rest of its life. We can’t force that shell open, as surely as we can’t force open the petals of a flower. Anyone who thinks parenting is not an art, has never been a parent. As with all things, there’s a happy medium. A time to ask our children to express anger and frustration and a time to distract them from it, thereby lessening its impact and making the event that inspired the anger more forgettable. A time to help and a time to stand back and watch. A time to prevent a fall and a time to let them take a risk and experience their own consequences without throwing pillows in front of them and making them afraid to take chances later. Knowing the difference is where the art comes in. There is also value in looking at these stages and identifying the ones we didn’t make it through as well as we might have. Did you feel trustful as an infant? Did you get fed when you were hungry and held when you cried? Or were you neglected and develop a feeling that you couldn’t trust this world? Did you feel autonomous as a toddler, or did someone in your life make you feel shame and doubt? There are adults who will do that, even to a kid. Maybe especially to a kid, because they’re helpless and can’t knock their blocks off. Did you feel resourceful from age 3 to 5? Did you build elaborate palaces with your blocks and Lego’s, or was there someone there who made you feel guilty for being alive? Again, there are adults who hate everything they either never had, or lost. Their seething bitterness compels them to stomp all the good right out of a child’s heart. Did you feel industrious from age 5 to 13, or were you already developing an inferiority complex from all the garbage that unhealthy adults already piled on you? Did you have a firm sense of who you were from 13 to 21? Failing early stages causes failure in subsequent stages. It’s the worst kind of domino principle. Did you have a healthy love relationship(s) from 21 to 39 or did you spend too much time alone? Did you (or will you) have purpose and love your work from 40 to 65? If you’re over 65, do you feel peaceful in the knowledge that you were a good person and you did your best (integrity), or are you kicking yourself for mistakes (despair)? It’s pretty easy to spot the elderly people who are in despair. They’re the ones who yell “Get off my lawn!” when a kid dares to set foot on it. Or just the ones who are sad, living in houses where sunlight struggles to enter through cracks in closed curtains. I don’t mean to be bleak, but every stage has an opposite, and to begin to do the work, we need to identify the problem and admit there was one. Most of us are probably somewhere in the middle. We got what we needed but have a little work to do because of what we didn’t. Others struggled through childhood and have a lot of work to do. Others were abandoned almost completely, in every way, and grew to become very frustrated adults. As a parent, I have remembered what was missing from my childhood by watching them reach out to me for the same things. And giving them the love, praise or just time that I didn’t always receive, I not only prevent the need for future healing in them, I heal myself. It’s good to break chains. The next challenge is not condemning our own parents for what they did wrong. They could only work with the tools they had, tools that were given to them by their parents. The healthier activity is to increase the number of tools in our own toolboxes. Wishing you and your children trust, autonomy, initiative, industry, identity, intimacy, generatively and integrity! This entry was posted in Childhood, Fatherhood and tagged an ounce of prevention, child psychology, childrearing, Erik Erikson, loving children, parenting, preventing damage, psycho-social development, psychology, raising children, stages of development, therapy by markrickerby. Bookmark the permalink.